← How many Liberians will celebrate ‘July 26’ abroad? Yes, September 26, 2013 was a historic day. On that day the Appeals Chamber of the Special Court for Sierra Leone (SCSL) rendered its verdict in the ‘Charles Taylor trial’. In a packed court room presiding Justice George Gelaga King announced that the six judges of the Appeals Chamber unanimously upheld last year’s conviction of former President Charles Taylor on 11 counts of war crimes and crimes against humanity. The Appeals Chamber also affirmed the 50-year sentence imposed by the Trial Chamber last year. The 65-year old former President will serve his sentence in Belmarsh Prison, a Category A men’s prison in south-east London, England. The Belmarsh Prison is often used for the detention of convicted terrorists but among the inmates also are dangerous psychopathic pedophiles and notorious child killers. At one time the prison also housed Ronnie Biggs, a famous English criminal, known for his role in the 1963 Great Train Robbery. Given his age and 50-year sentence Charles Taylor is not likely to leave this high-security prison alive. Victims and political leaders will feel greatly relieved knowing that he, once the most wanted man in West Africa, will not be back in the region. In one way or the other, Charles Taylor was meddling in many West African countries: Burkina Faso, Côte d’Ivoire (Ivory Coast), Guinea-Conakry, the Gambia, Ghana, Nigeria, not to speak of Liberia where he started the civil war in 1989. It is important to mention that the Special Court for Sierra Leone found him guilty of aiding and abetting crimes committed by the Revolutionary United Front (RUF) and the allied Armed Forces Revolutionary Council (AFRC) against Sierra Leones civilian population. He was not convicted because of his subversive and criminal role in the other West African countries mentioned, in particular Liberia. Liberia’s Truth and Reconciliation Committee (TRC) in its final report (2009) recommended the creation of an Extraordinary Criminal Tribunal for Liberia and the prosecution of the following Liberians for war crimes, human rights abuses and economic crimes: Charles G. Taylor, Prince Y. Johnson, Roosevelt Johnson, Alhaji G.V. Kromah, George Boley, Thomas Yaya Nimley, Sekou Damate Conneh and François Massaquoi. 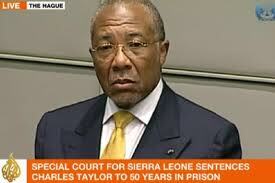 Except for Charles Taylor, none of these notorious and feared warlords ever stood trial. They are as free as a bird and live in Liberia. During the recent celebrations of ‘10 years of peace’, in August, President Ellen Johnson Sirleaf even awarded certificates to leaders of warring factions, ‘in acknowledgement of their contribution to peace’. Needless to say that this sparked widespread anger among victims of the two civil wars and their relatives. The conviction of Charles Taylor is an important step in the right direction. Charles Taylor is the first former Head of State to be convicted for war crimes by an international criminal court since Neurenberg in 1946. But his conviction does not bring justice to other victims of heinous crimes committed by or in name of political leaders and even Heads of State. Former President of Chad, Hissein Habré, ruled over this vast and oil-rich Central African country from 1982 to 1990. Habré, also called ‘Africa’s Pinochet’, is accused of war crimes and torture during his eight years in power. Human rights organizations hold him responsible for the killing and torture of maybe as many as 40,000 people, but the exact number is not known. He was deposed in 1990 and fled to Senegal. On the eve of his departure from N’Djamena, the country’s capital, he stole millions from the National Treasury. During seventeen years he managed to escape arrest, until 2007 when he was placed under house arrest. On June 30 of this year he was finally arrested by the Senegalese police and charged with crimes against humanity and torture. Another former Head of State who manages to escape from justice is Haile Mariam Mengistu of Ethiopia aka the ‘Red Emperor’. Mengistu also fled after losing power when Meles Zenawi’s TPLF forces entered the capital Addis Ababa. Mengistu was granted a comfortable place to live in Zimbabwe by Robert Mugabe, also a Head of State who considers himself above the law. President Omar Al-Bashir of Sudan is wanted by the International Criminal Court but travels freely to neighboring countries challenging his prosecutors. Also in East Africa, President Uhuru Kenyatta of Kenya is under fire. Both he and Deputy President William Ruto, a Kalenjin leader and former enemy, are accused of ethnic cleansing and murder in 2008, leaving some 1,500 people dead. Early September 2013 Kenya’s parliament voted to withdraw from the International Criminal Court (ICC). Nonetheless, the trial of Kenya’s Deputy President William Ruto on charges of crimes against humanity commenced on September 10. President Uhuru Kenyatta’s trial is scheduled to start on November 12. In West Africa President Blaise Compaoré of Burkina Faso rules since October 1987 after his friend and colleague Thomas Sankara was murdered. There is a persistent rumor in West Africa that Compaoré and Charles Taylor, who knew each other from Gaddafi’s military training camps in Libya, had a secret deal: Compaoré would help Taylor to get rid of President Samuel Doe, and Taylor would assist Compaoré in eliminating President Sankara. We know the rest of the story. Burkinabé military were with Charles Taylor’s NPFL when they invaded Liberia, from Ivory Coast, in 1989. A UN report established Burkina’s role in the shipment of arms to Liberia – despite a UN arms embargo – as was even referred to by the Appeals Chamber of the SCSL in its final verdict, on September 26. In 2010 Prince Johnson, Liberian warlord and comrade-in-arms of Charles Taylor before he broke with him in 1990, declared when interviewed by the French news agency AFP that he and other Liberian fighters had killed President Sankara in 1987 in Ouagadougou, Burkina’s capital, thus clearing the way for Blaise Compaoré. 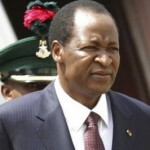 President Compaoré has been ruling Burkina Faso for almost 26 years. The country is seen as one of West Africa’s most stable countries. For geo-political reasons the USA, France and other powers see no reason to isolate or alienate Blaise Compaoré, considered a reliable ally in an unstable region, notwithstanding the serious accusations. 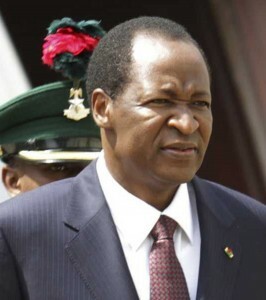 In neighboring Mali, Burkina is the most important outside mediator in the conflict between the central government in Bamako and the secessionist Tuareg in the north of the country. I wrote on April 28, 2012, two days after the Trial Chamber of the Special Court for Sierra Leone found the former Liberian president guilty of ‘aiding and abetting crimes in Sierra Leone’, that the conviction of Charles Taylor is a victory for justice, but not an end to impunity in Africa. I see no reason to change my opinion. Justice delayed is justice denied. This entry was posted in African Politics, Alhaji Kromah, Blaise Compaore, Chad, Charles Taylor, Civil War(s) Liberia, Ellen Johnson Sirleaf, Ethiopia, Gaddafi, George Boley, Guinea Conakry, Haile Mariam Mengistu, Hissein Habré, Impunity in Africa, International Criminal Court ICC, Ivory Coast, Justice, Kenya, Liberia, Liberian History, Libya, Mali, Meles Zenawi, Nigeria, Omar al Bashir, Prince Y. Johnson, Robert Mugabe, Roosevelt Johnson, Samuel Kanyon Doe, Sierra Leone, Sierra Leone Special Court, The Gambia, Truth and Reconciliation Committee (TRC), Tuareg, Uhuru Kenyatta, William Ruto, Zimbabwe. Bookmark the permalink.